tails looks cute!. . Wallpaper and background images in the Miles "Tails" Prower club tagged: tails cute. OMG, WHAT A CUTE PPICTURE!!!!!!!!!!!! 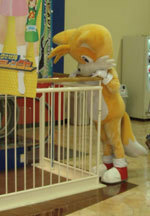 i want a tails costume!!!! What are you doing redrebel?